Well we finally have come to the moment when all our efforts have borne fruit and the diorama is open. Roly has put some magnificent photos onto the blog-site, but for those who have not yet seen it for real, no pictures can do justice to the amazing sight when you actually see it. In three months we have achieved something pretty amazing. Well done everyone. Looking through your comments on this blog-site and your own web-sites I am pleased to see that this has been great for the wargaming hobby. It has opened us up to the community and there has been a genuine interest in what we were doing. It gave us contacts with people that hadn't been part of a group or club but who now know so many more people with a similar interest. For many it gave exposure to a new genre or historical era of gaming. I doubt if more than a couple would have contemplated painting WW1 figures before this project. It also taught many of us some new techniques, either through the painting guides or by the group painting sessions where we could learn from others. So let me thank you all for contributing to such an amazing feat. All of you deserve praise for doing whatever you could to help. However can I single out some for special mention? First, to Roly who has made the project alive and visible through the blog site. It would not have captured our own, let alone the public's imagination without that as a hub around which we worked. He was dedicated enough to ensure that most days there was some news and encouraged this to be not just about the figures, but also about us. Well done, Roly and thank you. Secondly my thanks go to the regional coordinators: Frank Ansell, David Mulder, Darcy Perry, Greg Kindell, Terry Swain, Tom Leamy, Caleb Chandler, Vince Cholewa, Sam Campbell, Alastair Mundell, Tim Driver, Craig Courtis and Joel Cunningham. Your work made it actually happen, through the practical distribution and collection of the figures, which meant many extra hours of organisation on top of your own painting. Also deserving praise are the hobby shops that supported us through discounts for the paints and supplies. I know that there were many who did this that I am not aware of, so please tell me those that I have missed: Comics Compulsion in Christchurch, Gateway Cyber Cafe in Tauranga, Cool Toys in Napier, Vagabonds in Auckland and Hobby Master in Ellerslie. And also can I thank John Hutton, who helped me at the start with the potential contacts in each club and worked with Terry to organise the Wellington City painters, and also to Michail Woolf, who volunteered the help of Toll Logistics for the delivery of the figures. My final uttermost thanks are to those from the Wellington and Kapiti region who gathered for the final push in the first half of April. I think we will all remember with awe the first time we walked into the Weta building and saw the diorama. Your efforts at assisting with the foliage placement and the Herculean work on standardising, fixing and topping up the figures gave us success. Thanks for giving up your Easter weekend and the week-days in between. For Paul Goldstone, Brian Smaller, Sam and Fern Campbell (plus all your family) your efforts stand out even amongst this last group. Well done. Thank you. There is little that I can do to repay you all with at the moment, apart from an offer for you to visit and get a personal tour of the exhibition from me. Contact me on nzarmchairgeneral@gmail.com so we can coordinate timings for meeting up. Well .... you have now been released back to your own interests to get on with the lead mountain that has remained untouched for quite some time. how on earth do you go back to painting figures as small as 28 or 15 mm? what to do with all that b#*&%y Zanddri Dust and Ushabti Bone paint? It has been great to work with you all. Thanks for your patience (and that of your families). We'll be in touch again. 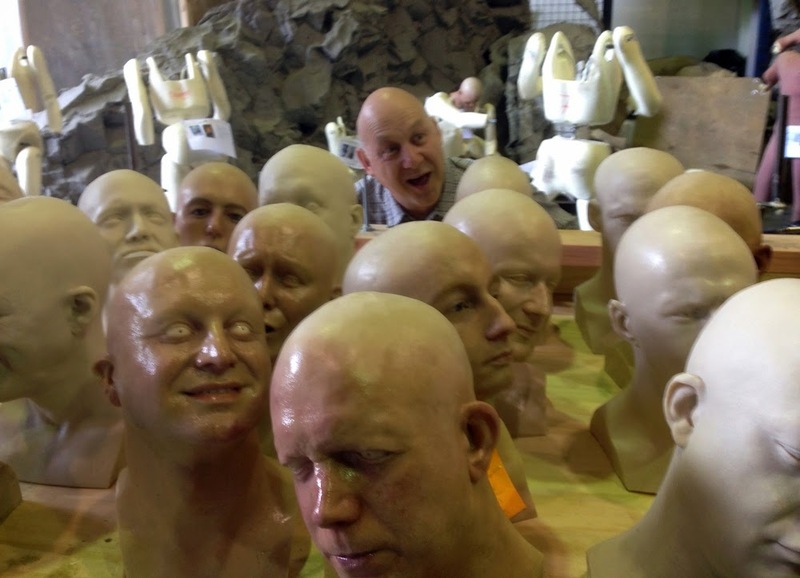 Armchair General hides amongst the Weta Workshop mannequins. It's been a pleasure Rhys! It was a pleasure and a privilege to be involved in the diorama. Thanks Rhys for giving us Kiwi wargamers a chance to contribute to contribute to such a moving memorial to those that died.